Grand Rapids, Mich - The Rockford IceHogs (30-14-7-4) held a 1-0 lead until early in the third, but the Grand Rapids Griffins (34-20-1-1) fought back in the third and eventually earned a 2-1 OT win on Wednesday night. It was the fifth overtime loss in the last 12 games for Rockford. With a power play carrying over from the end of the third into overtime, the Griffins took advantage. Just 39 seconds into sudden death, Mark Zengerle bounced a pass off of a sprawling IceHogs defenseman and past goaltender Michael Leighton to secure the win for Grand Rapids. The Griffins carried the play though the majority of the first period, and nearly took a lead midway through frame. Tyler Bertuzzi had an open look at the right circle, but rang his shot off the crossbar to keep the game scoreless early on. After Leighton kept the IceHogs in the game to start the contest, Bryan Bickell produced the lone first period goal. Garret Ross knocked the puck to Ryan Hartman in the left corner, and Hartman fed a pass to Bickell right between the circles. Bickell fired a hard wrister past Tom McCollum at 15:44 of the first to give Rockford a 1-0 lead. Penalties filled the middle frame, as the IceHogs were awarded four power play opportunities in the period. 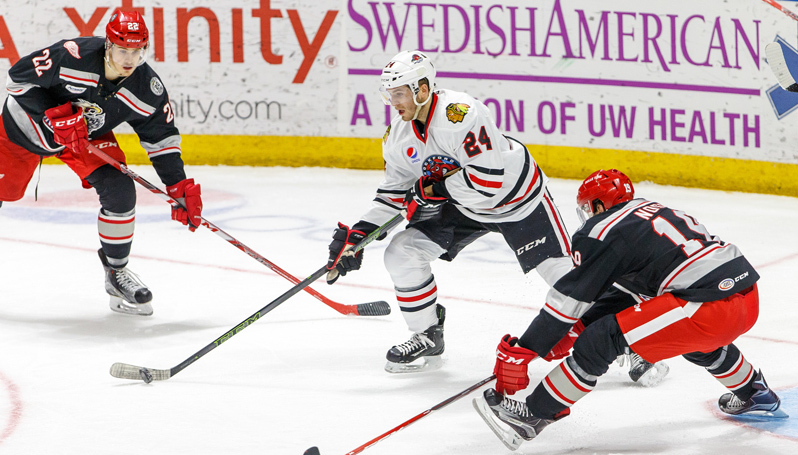 The Griffins penalty kill put forth a strong effort in stopping Rockford on all four chances as the IceHogs continued to lead 1-0 heading into the third. Tyler Bertuzzi eventually found the game-tying goal in the third period. Mark Zengrele took a pass from Xavier Ouellet at the left circle and immediately snapped a pass across the ice. Bertuzzi's one-timer just got past Leighton to tie the game at 1-1 at 6:37 of the period. Leighton stopped 30 of the 32 shots he faced. McCollum, who appeared in his 214th game in a Griffins uniform, stopped 20 of 21.